Worked as a Professional Staff (Associate Team Leader) of the project entitled “Processing of cassava through small scale enterprise to improve livelihood of rural poor in Madhupur Upazila”. Funded by REFPI (Research and Extension Farm Power Issues) project of DFID (Department for International Development), UK. Worked as an Associate Investigator of the project entitled “production of wheat bran protein concentrate and its food application”. Funded by the Ministry of Science and Information & Communication Technology, Govt. of Bangladesh. Worked as an Associate Investigator of the project entitled “Assessment of toxic metallic contamination in different fish species of the polluted rivers”. Funded by the Ministry of Science and Information & Communication Technology, Govt. of Bangladesh. Worked as a Co-Investigator of the project entitled “Consumption of unsafe foods: evidence from heavy metal and trace element contamination”. Funded by FAO (Food and Agriculture Organization), UN (United Nation). Worked as a Member of the project entitled “Academic quality improvement of Agricultural Engineering Faculty Graduates through sustainable self-assessment process”. Funded by HEQEP-AIF, UGC, World Bank. Worked as a Head (PSAC) of the project entitled “Self-assessment of B. Sc. Food Engineering Program”. Funded by HEQEP-AIF, UGC, World Bank. 1. Regional training on “Managing national standards development projects and programmes (MSPP)” organized by ISO, Geneva, Switzerland at Mandarin Oriental Hotel, Jakarta, Indonesia on 13 16 August, 2018. 2. Training on “Intellectual Property Rights (IPR) and Technology Management” organized by Krishi Gobeshona Foundation (KGF), at BRAC-CDM, Savar, Dhaka on 24 to 26 June, 2018. 3. Training on “Risk Assessment & Control Measures in Food Processing” jointly organized by BSTI and Bureau Veritas (Bangladesh) Private Limited funded by FAO on 27 to 29 May, 2018. 4. Training on “Interdisciplinary Research” jointly organized by Interdisciplinary Centre for Food Security (ICF), Bangladesh Agricultural University, Bangladesh and Wageningen University, The Netherlands on 16 to 17 April, 2017. 5. 2nd Conference on “Conservation Agriculture for Smallholders (CASH-II)” organized by Murdoch University, Australia and Bangladesh Agricultural University, Bangladesh on 14 to 16 February, 2017. 6. Executive training B. Sc. course on “Food Safety Risk Management and Regulatory Affairs”, Dublin Institute of Technology (DIT), Dublin, Ireland on 16 to 20 January, 2017. 7. 7th International Seminar of Regional Network on Poverty Eradication (RENPER) “Advancement in technology for poverty reduction: opportunities and challenges” organized by Bangladesh Agricultural University, Mymensingh-2202, Bangladesh on 13 to 15 November, 2016. 8. Lost Harvest and Wasted Food – managing the crop supply chain for increased food security at Centre for Development Innovation, Wageningen University, Netherland funded by Netherlands Fellowship Programmes (NFP) on 12 to 23 September, 2016. 9. Regional dissemination workshop on the process and outputs of the IUCN Red List of Threatened Species and science conference updating species red list of Bangladesh IUCN Bangladesh country office funded by IUCN-BAU on 7th December, 2015. 11. 7th National Seminar on “Dairy Sector: The key player for nutritional Security in India” Organized by NDRI Graduates Association, ICAR-NDRI, Karnal, Haryana, India on September 19 – 20, 2014. 12. Workshop on “Research to Inform Food and Nutrition Security Policies”, Organized by FAO, supported by EU and USAID at Ruposhi Bangla Hotel, Dhaka, Bangladesh on July 3 and 4, 2013. 13. Workshop on “Research to Inform Food and Nutrition Security Policies”, Organized by FAO, supported by EU and USAID at Ruposhi Bangla Hotel, Dhaka, Bangladesh on November 28 and 29, 2012. 14. Workshop on “Potato Processing in Bangladesh”. Organized by Katalyst and AFE at Ruposhi Bangla Hotel, Dhaka, Bangladesh on July 17, 2012. 15. Workshop on “Research to Inform Food and Nutrition Security Policies”, Organized by FAO, supported by EU and USAID at Ruposhi Bangla Hotel, Dhaka, Bangladesh on May 7 and 8, 2012. 16. Workshop on “Research to Inform Food and Nutrition Security Policies”, Organized by FAO, supported by EU and USAID at Ruposhi Bangla Hotel, Dhaka, Bangladesh on December 11 and 12, 2011. 17. Seminar and workshop on Women in Academia – for your Career. Organized by the Swedish Institute (SI) at hotel Lundia and Gamla Biskopshuset conference hall, Lund, Sweden on November 25 to 26, 2010. 18. Symposium on Dietary fatty acids and health. Organized by the Swedish National Committee for Nutrition and Food Sciences of the Royal Swedish Academy of Sciences at Kungl Vetenskapsakademien, Lilla Frescativagen 4A, Stockholm, Sweden on 3rd November, 2009. 19. Workshop on A social entrepreneurship approach to graduate and undergraduate training in policy analysis for the global, national and local food systems. Sponsored by Cornell University, USA, Prof. Per Pinstrup-Andersen, Program coordinator at BRAC, Bangladesh from February 9 to 11, 2009. 20. Training course on Teaching Methods and Techniques. Sponsored by Canadian Government, Prof. Bev Beggaman, Program Coordinator, Olds College, Canada, from October 20 to 31, 2002. 21. In country training program on Communication and Presentation Skill. Sponsored by Department or International Development (DFID), UK from June 18 to 20, 2002. 22. Training course on Scientific Report Writing. Organized by Graduate Training Institute (GTI), Bangladesh Agricultural University from February 2 to 7, 2002. 23. Workshop on Teaching Methods. Sponsored by the Department for International Development (DFID), UK. Dr. Robert McBride, Course organizer, Director of International Education, University of East Anglia, UK from July 1 to 6, 2000. 24. International workshop on Small-scale food processing for sustainable livelihood in Asia. Sponsored by the Intermediate Technology Development Group (ITDG), Bangladesh from February 18 to 19, 2000. 25. Training workshop on Application of GIS in Agricultural Development Planning. Sponsored by Bangladesh Agricultural Research Council (BARC), Dhaka, Bangladesh from August 10 to 11, 1999. 1. Shams-Ud-Din, M., M. A. Alim and M. A. Kafi. 1996. Upgrading and utilization of rice bran for high-fibre food formulations: Effects of various levels of extracted rice bran on the quality of bread. Journal of the IEB/AE Div. 24Ae(1) 19-24. 2. Shams-Ud-Din, M., M. A. Alim and M. A. Kafi. 1999. Effects of aqueous extracted rice bran on its performance as a bread ingredient. Bangladesh J. Agri. Sci. 26(1) 73-79. 3. Alim, M. A. and M. Shams-Ud-Din. 1999. Using aqueous extracted rice bran as a supplement to formulation of cracker biscuits. Bangladesh J. Agril. Engg. 10(1&2) 27-37. 4. Alim, M. A. and M. Shams-Ud-Din. 2000. Properties of sweet biscuits incorporating aqueous extracted rice bran. Progress. Agric. 11(1&2) 181-186. 5. Alim, M. A. and M. Shams-Ud-Din. 2001. Study on the evaluation of sweet biscuit quality parameters supplemented with extracted rice bran. Bangladesh J. Train. and Dev. 14(1&2) 39-48. 8. Alim, M. A. and M. Shams-Ud-Din. 2003. Studies on the baking properties of cracker biscuits incorporating cassava flour. Bangladesh J. Agril. Engg. 14(1&2) 87-97. 9. Alim, M. A., Lee, J. –H., Akoh, C. C. and Lee, K. –T. 2008. Characterization of solvent-fractionated mustard oil by high performance liquid chromatography. Progress. Agric. 19(1): 135-141. 10. Alim, M. A., Lee, J.-H., shin, J.-A., Lee, Y. J., Choi, M.-S., Akoh, C.C. & Lee, K.-T. 2008. Lipase-catalyzed production of solid fat stock from fractionated rice bran oil, palm stearin and conjugated linoleic acid by response surface methodology. Food Chemistry 106, 712-719. 11. Alim, M. A., Lee, J.-H., Akoh, C. C., Choi, M.-S., Jeon, M.-S. , Shin, J.-A. & Lee, K.-T. 2008. Enzymatic transesterification of fractionated rice bran oil with conjugated linoleic acid: Optimization by response surface methodology. LWT 41, 764-770. 12. Alim, M. A., Lee, J. H. and Lee, K. T.. 2009. Production of lipase-catalyzed solid fat from mustard oil and palm stearin with linoleic acid by response surface methodology. J. Sci Food Agric, 89: 706-712. 13. Hu, J. N., Alim, M. A., Lee, J. H., Adhikari, P. and Lee, K. T. 2009. Production of lipase-catalyzed structured lipids from mustard oil with capric acid. Food Sci. Biotechnol., 18: 574-577. 14. Zhu, X. M., Alim, M. A., Hu, J. N., Adhikari, P., Lee, J. H. and Lee, K. T. 2009. Lipase-catalyzed production of solid fat containing conjugated linoleic acid in Binary models. Food Sci. Biotechnol., 18: 803-807. 15. Alim, M. A., Lee, J. –H., Akoh, C. C. and Lee, K. –T. 2009. Enzymatic synthesis of low-trans blend from fractionated mustard oil and palm stearin with linoleic acid using response surface methodology. J. Bangladesh Agril. Univ. 7(1): 169-176. 16. Rahman, M. M., Alim, M. A., Jiku, M. A. S. and Halim, M. A. 2009. Assessment of toxic metallic contamination in different fish species of polluted rivers. BAU Res. Prog. 20:39 – 40. 17. Alim, M. A., Wessman, P. and Dutta, P. C. 2011. Synthesis of esterified solid fat from fractionated rapeseed oil and palm stearin modeling by response surface methodology. Journal of the Bangladesh Agricultural University, 9(2): 273-282. 18. Alim, M. A., Iqbal, Z. and Dutta, P. C. 2012. Studies on the characterization and distribution of fatty acids and minor components of high-erucic acid mustard oil and low-erucic acid repeseed oil. Emir. J. Food Agric. 24(4): 281-287. 19. Alim, M. A., Wessman, P. and Dutta, P. C.. 2013. Minor components and oxidative stability determined by DSC of fractionated and lipase-catalyzed structured rapeseed oil. Grasas y aceites. 64(3): 264-271. 20. Sarker, S. K. and Alim, M. A. 2013. Processing and storage of sweetened condensed corn milk. Journal of Agricultural Engineering, The Institution of Engineers, Bangladesh.40/AE(1): 11 – 20. 21. Alim, M. A., Ahmed, R., Arefin, M. A. and Sobhan, M. M. 2013. Preparation of green mango ready-to-drink juice. Journal of Agricultural Engineering, The Institution of Engineers, Bangladesh.40/AE(1): 43 – 50. 22. Shanta, F.H., Rajib, R.R, Alim, M. A. and Haque, M. R. 2014. Studies on the preparation of stem amaranth pickle. J. Bangladesh Agril. Univ. 12(1): 177 – 182. 23. Rahman, M. M., Jiku, M. A. S., Alim, M. A. and Kim, J. E. 2014. Exploration of metallic contamination in fish species of the polluted rivers in Bangladesh. J. Appl. Biol. Chem., 57(2): 131 – 136. 24. Sultan, A., Rahman, M. R. T., Islam, M., Rahman, M. and Alim, M. A. 2014. Evaluation of quality of chapaties enriched with jackfruit seed flour and bengal gram flour. IOSR Journal of Environmental Science, Toxicology and Food Technology. 8(5): 73 – 78. 25. Sobhan, M. M., Ahmed, R., Mazumder, M. N. I. and Alim, M. A. 2014. Evaluation of quality of biscuits prepared from wheat flour and cassava flour. International Journal of Natural and Social Sciences. 1: 12 – 20. 26. Alim, M. A., Wadehra, A and Singh, A. K. 2014. Fatty acid composition profile and minor components like sterols and tocopherols of ghee collected from direct cream method. FSC brief No. 30. 1-6. 28. Sharmin, M. R., Islam, M. N. and Alim, M. A. 2015. Shelf-life enhancement of papaya with aloe vera gel coating at ambient temperature. J. Bangladesh Agril. Univ. 13(1): 131-136. 29. Yasmin, S., Islam, M. N. and Alim, M. A. 2015. Mechanical drying of fresh and osmosed mushroom. J. Bangladesh Agril. Univ. 13(2): 307 – 314. 30. Alim, M. A., Wedehra, A. and Singh, A. K. 2016. Effect of various plant starches on the quality characteristics of starch-based sweetened cow milk yoghurt. J. Bangladesh Agri.l Univ. 14(1): 119 – 126. 31. Islam, M. R., Jahiruddin, M., Islam, M. R., Alim, M. A. and Akhtaruzzaman, M. 2016. Dietary intake of trace elements by poor and non-poor households of Dhaka city, Bangladesh. 7th International Seminar of RENPER, 122. 32. Khan, S. A., Saqib, M. N. and Alim, M. A. 2016. Evaluation of quality characteristics of composite cake prepared from mixed jackfruit seed flour and wheat flour. J. Bangladesh Agril. Univ. 14(2):219-227. 33. Siddiqui, A. A. and Alim, M. A. 2017. Design of HACCP plan for biscuit industry in Bangladesh. Elixir Food Science, 105: 46070 – 46077. 34. Ahmmed, R., Inam, A. K. M. S., Alim, M. A., Sobhan, M. M. and Haque, M. A. 2017. Extraction, characterization and utilization of pectin from jackfruit (Atrocarpus heterophyllus L.) waste. Bangladesh J. Environ. Sci., 32: 57-66. 36. Roy, J., Alim, M. A. and Islam, M. N. 2017. Drying kinetics and determination of water sorption isotherms of corn. J Bangladesh Agril Univ 15(2): 309–317. 37. Siddiqui, A. A., Alim, M. A. and Rahman, M. M. 2017. Effects of HACCP Implementation on Quality Attributes of Fortified Bakery Products in the Food Industry of Bangladesh. Elixir Food Science 113: 49287-49291. 38. Yasmin, S., Islam, M. N., Alim, M. A and Kamal, M. S. 2017. Osmotic dehydration kinetics of oyster mushroom. J Bangladesh Agril. Univ. 15(2): 318-324. 40. Akter, N. and Alim, M. A. 2018. Preparation of wheat-potato-peanut composite flour cakes. J. Bangladesh Agril. Univ. 16(2): 315- 321. 41. Ferdous, M. J. and Alim, M. A. 2018. Physico-chemical properties of mixed jam from pineapple and sweet gourd. J. Bangladesh Agril. Univ. 16(2): 309- 314. 42. Jahan, R., Islam, M. A., Akter, F., Alim, M. A. and Islam, M. N. 2019. Mechanical and osmotic dehydration behavior of pineapple and retention of vitamin C. Fundam Appl Agric. 4(1): 723 – 734. 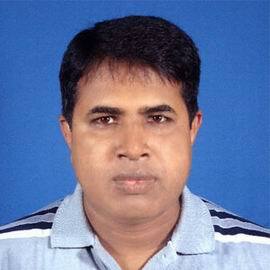 House Tutor, New Satri Hall, Bangladesh Agricultural University from 03-03-2003 to 25-02-2005. Assistant Proctor, Bangladesh Agricultural University from 31-05-2008 to 30-08-2009. Head, Department of Food Technology and Rural Industries, Bangladesh Agricultural University from 01-09-2011 to 30-08-2013. Director, Transport Section, Bangladesh Agricultural University from 01-01-2015 to 31-12-2016. Director, Security Section, Bangladesh Agricultural University from 13-04-2018 to date. Head, Department of Food Technology and Rural Industries, Bangladesh Agricultural University from 01-10-2018 to date.